I just had to share the project that I worked on today. As a bit of background, my husband and I eat basically low carb, and I am always trying to come up with new ways to” have our cake and eat it too.” That said, my husband is a hamburger lover and he really feels deprived when he has to go without. 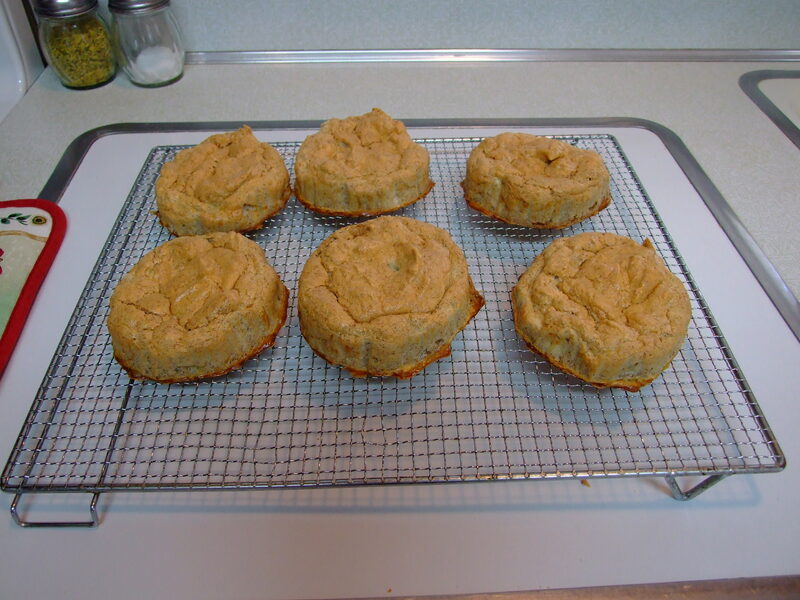 So….. to remedy the problem, I have come up with a hamburger bun recipe that has but 2 carbs. Below is a peek at the result. I have created a PDF recipe for you to upload if you desire. I have to tell you that he was really impressed. They are light, tasty, and stay together well, even with a juicy piece of hamburger, onion, fresh home grown tomatoes, and the works resting between the layers. They, of course, cut easily with a bread knife. I have also used them to make open face grilled cheese, and tuna sandwiches.